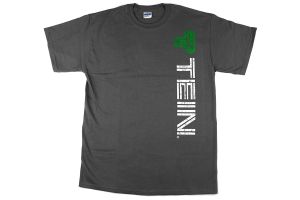 Be the envy of all your friends with this weathered looking t-shirt from Tein. Well....not really. But the gray color of this shirt is pretty close to spilled-fluid colors. It's become my go-to for working on my car. The weathered look of the logo makes it seem like it's the one you dug out of your dryer 4 years later anyway, and makes it perfect for getting down and dirty under your hoopty. It's a thicker material than a lot of RallySport's t-shirts, but still very durable and breathable. Sizes are correct fitment, but if you're a little more load-bearing in the stomachial region, you may want to go up a size more than normal, as they are not super long. That aside, A+ to Tein for making it, and also to RSD for selling it.